Using a fast shutter speed is the key to capturing a blur-free shot of any moving subject with your Nikon D5300, whether it’s a flower in the breeze, a spinning Ferris wheel, or, a racing cyclist. 1Set the Mode dial to S (shutter-priority autoexposure). 2Rotate the Command dial to select the shutter speed. After you select the shutter speed, the camera selects an aperture (f-stop) to match. What shutter speed should you choose? Well, it depends on the speed at which your subject is moving, so you need to experiment. But generally speaking, 1/320 second should be plenty for all but the fastest subjects (race cars, boats, and so on). For very slow subjects, you can even go as low as 1/250 or 1/125 second. 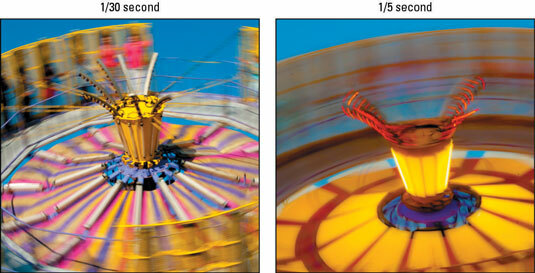 Remember, though, that when you increase shutter speed, the camera opens the aperture to maintain the same exposure. At low f-stop numbers, depth of field becomes shorter, so you have to be more careful to keep your subject within the sharp-focus zone as you compose and focus the shot. You also can take an entirely different approach to capturing action: Rather than choose a fast shutter speed, select a speed slow enough to blur the moving objects, which can create a heightened sense of motion and, in scenes that feature very colorful subjects, cool abstract images. 3In dim lighting, raise the ISO setting, if necessary, to allow a fast shutter speed. Unless you’re shooting in bright daylight, you may not be able to use a fast shutter speed at a low ISO, even if the camera opens the aperture as far as possible. If auto ISO override is in force, ISO may go up automatically when you increase the shutter speed. Raising the ISO does increase the possibility of noise, so you have to decide whether a noisy shot is better than a blurry shot. Why not add flash to brighten the scene? Well, adding flash is tricky for action shots, unfortunately. First, the flash needs time to recycle between shots, which slows the capture rate. Second, the built-in flash has limited range, so don’t waste your time if your subject isn’t close by. And third, remember that the fastest shutter speed you can use with flash is 1/200 second by default, which may not be high enough to capture a quickly moving subject without blur. 4For rapid-fire shooting, set the Release mode to Continuous Low or Continuous High. In both modes, you can capture multiple images with a single press of the shutter button. Continuous Low captures up to 3 frames per second (fps), and Continuous High bumps the frame rate up to about 5 fps. As long as you hold down the button, the camera continues to record images. Here again, though, you need to go flash-free; otherwise, you get one shot per press of the shutter button, just as in Single Frame release mode. Set the AF-area mode to one of the Dynamic Area settings. Set the Autofocus mode to AF-C (continuous-servo autofocus). At these settings, the camera sets focus initially on your selected focus point but then looks to the surrounding points for focusing information if your subject moves away from the selected point. Focus is adjusted continuously until you take the shot. 6Compose the subject to allow for movement across the frame. Frame your shot a little wider than you normally might so that you lessen the risk that your subject will move out of the frame before you record the image. You can always crop to a tighter composition later. It’s also a good idea to leave more room in front of the subject than behind it. This makes it obvious that your subject is going somewhere. Using these techniques should give you a better chance of capturing any fast-moving subject, but action-shooting strategies also are helpful for shooting candid portraits of kids and pets. Even if they aren’t currently running, leaping, or otherwise cavorting, snapping a shot before they do move is often tough. So if an interaction catches your eye, set your camera into action mode and fire off shots as fast as you can.